Is America's Political "Nobility" Undemocratic? 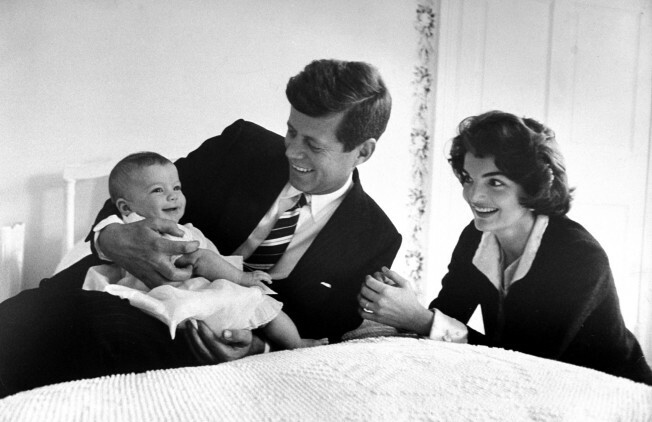 Sen. Jack Kennedy cuddling his darling baby daughter Caroline who is smiling as her mom Jackie looks on in delight while relaxing on bed at home on March 25, 1958. WASHINGTON - “No Title of Nobility shall be granted by the United States,” reads Article I of the Constitution. Yet with their fondness for political dynasties, American voters have created their own notion of modern nobility: families such as the Kennedys, the Rockefellers, the Bushes, and the Bidens who win political office generation after generation. Eleven current members of the Senate are the children of former senators or governors, or the spouses of former senators, governors, and even a president. Then there's Jeb Bush. He is the former governor of Florida and the grandson of former Connecticut Sen. Prescott Bush. He's also the son of one president, the brother of another, and the Republican front-runner for the Senate seat which Sen. Mel Martinez is giving up in 2010. Delaware Gov. Ruth Ann Minner recently named Ted Kaufman, an adviser to Joe Biden, to fill the vice president-elect's Senate seat until a 2010 special election. Some observers believe Kaufman is keeping the seat warm for Delaware Attorney General Beau Biden, Joe Biden's son, should he decide to run in 2010. And now Caroline Kennedy, the daughter of the slain President John F. Kennedy and the niece of Sen. Ted Kennedy, D-Mass., is running a campaign to persuade New York Gov. David Paterson to appoint her to the seat to be vacated by Sen. Hillary Clinton, if the Senate confirms her as secretary of state. And Gov. Paterson is himself the son of a powerful New York politician. If Paterson were to hand the job to Caroline Kennedy, she'd be the seventh member of her family to serve in Congress, joining a roster which includes two of her uncles, two of her cousins, her father, and her great-grandfather, John F. Fitzgerald, who first went to Congress in 1895. The Constitution’s ban on titles of nobility (and, thus, on nobility itself) is “the corner-stone of republican government,” said Alexander Hamilton. And by “republican government,” he meant representative government, as in, people electing their leaders. But again and again “the people” have shown a preference for names they know. Sen. Charles Schumer, D-N.Y., recruited Pennsylvania State Auditor Bob Casey, Jr. to run for the Senate in 2006 partly because Casey’s father had served as governor and “Casey” was a potent brand name in the state. To some degree, dynastic politics may not be so different from Baltimore Orioles Hall of Famer Cal Ripken, Jr. learning baseball from his father, Baltimore Orioles coach Cal Ripken, Sr.
Senatorial children often learn some of their political skills through observation and osmosis. Sen. Chris Dodd, D-Conn., was greatly influenced by his father, Sen. Thomas Dodd, who had been a prosecutor at the Nuremberg Nazi war crime tribunal before his turn on Capitol Hill. Dodd published a book last year, "Letters from Nuremberg: My Father's Narrative of a Quest for Justice," and often referred to his father on the campaign trail last year when he sought the Democratic presidential nomination. While politics can be a family trade like sports or cattle ranching, this vocation often involves weighty decisions of war and peace. Although she spent part of her childhood in the White House, Caroline Kennedy has never held any elective office, unlike Chris Dodd and Bob Casey, Jr. who had previously served when they won their Senate seats. “The rampant nepotism in politics tells the American public that they don't live in a democracy, they live in an aristocracy where only those inside Washington's gated community are allowed to have power,” said syndicated columnist and author David Sirota. But Kerry Kennedy, daughter of Sen. Robert Kennedy and cousin of Caroline Kennedy, contended in an interview with MSNBC’s Norah O’Donnell on Tuesday that Caroline was qualified to serve in the Senate. If the idea of an American political nobility seems undemocratic, so can the appointment of senators. Most states allow governors to fill Senate vacancies, with only Oregon and Wisconsin requiring a special election to fill them. "Celebrity" appointments for these seats have sometimes gone awry. In August of 1964, Pierre Salinger, President Kennedy’s former press spokesman, was appointed by California Gov. Pat Brown to fill the seat left vacant by the death of Sen. Clair Engle. Salinger carried some of the Kennedy charisma by his association with JFK. But when Salinger ran for a full term in November of that year, he lost — to a fellow celebrity, Hollywood “hoofer” and singer George Murphy. Murphy painted Salinger, who’d been living in Virginia, as a carpetbagger.